Nabi Musa Season - What Do You Know About Nabi Musa Season? The maqam of Nabi Musa is considered a holy place because it houses the grave of Prophet Moses according to local tradition. Moslems recognize Moses as one of the great prophets. Muslims believe that Moses is buried here, although according to the Old Testament Moses never entered Palestine but rather died at Mount Nebo in modern-day Jordan. The development of the annual pilgrimage and festival of Nabi Musa goes back to the time of the liberation of Jerusalem by Saladdin from the crusaders. As a show of Muslim strength and good will to the Christians, Saladdin allowed, under the terms of the agreement, the Crusaders and other western pilgrims to visit the Christian holy places at Easter time. That is the reason why the festival of Nabi Musa falls always on the week preceding Easter. From that time on, thousands of Muslims from all over Palestine made it their habit to come to Jerusalem on Good Friday. They prayed in Al Aqsa Mosque and then marched in grand procession, singing religious songs, dancing the traditional dabkeh, and playing flutes and drums until they reached the maqam. Prayers, celebrations, horse racing and games continued for several days around the shrine. This has developed over the years to become one of the most attractive and popular festivals in Palestine. The Mawsim is a religious occasion but it is also a time for celebration and relaxation. It was an important social event too, since it brought together Palestinians from all parts of the country who met, discussed their affairs, forged links with one another, and planned joint activities. Delegations came from as far away as Haifa, Nablus, Jaffa, Hebron, Jerusalem, and others towns and villages in Palestine. 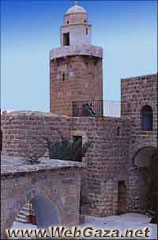 The 1937 ban on the Mawsim of Nabi Musa continued and the shrine was used as a military base under Jordanian rule and by the Israelis until 1973 when it was handed back to the Islamic Waqf in Jerusalem and the festivities were resumed for a number of years. The Mawsim was again stopped by the Israelis at the outbreak of the Palestinian Intifada against the occupation which started in December 1987. The Oslo accord of 1992 between Israel and the PLO placed the sanctuary under the jurisdiction of the Palestinian ministry of the Islamic Waqf. Major reconstruction and restoration were carried out. A Palestinian family from Jericho lives on the site and looks after it. They run a small shop selling interesting and unusual gifts, the proceeds of which go towards maintaining the site. The sanctuary is open daily from 8 until sunset, no entrance fee is required but donations towards the upkeep are welcome.